The Honor 7X was launched way back in October in China, and in other parts of the world a few months later. We loved the Honor 7X, as it offered incredible value for money. It was, in fact, our top budget value pick for 2017, which says a lot considering the devices it was up against. One major reason for it being so critically acclaimed was its price tag. The device was launched in the US at the highly-attractive price point of US$199.99, which made its value proposition a tad hard to compete with. That price tag came with a caveat, though: the device featured just 3 GB of RAM and 32 GB of storage in the US. In other parts of the world, the device came with 4 GB of RAM and up to 128 GB of storage. You'd expect an extra gigabyte of RAM to not have much of an effect on the overall package the device offers but that hasn't exactly been the case. Users in the US have reported multiple issues of lag and app instability, issues we believe may be due to the RAM shackles or, perhaps, other shortcuts Huawei may have taken in the production of the US variant. It wouldn't be the first time the company has been caught doing something similar, in any case, as the fiasco with the Huawei P10's memory still remains fresh in our memories. The company looks to have offered an option for people who aren't keen on buying the gimped US variant of the Honor 7X. The new device, the Mate SE, is, for all intents and purposes, a rebranded Honor 7X, albeit one with 4 GB of RAM and 64 GB of storage. Both devices are pretty much the same: the same cameras, SoC, battery, etc. There's a slight change in the design of camera design, though, and it, of course, comes with the Huawei branding instead of the Honor one on the 7X. 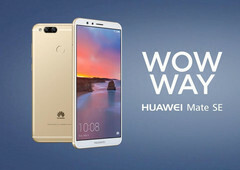 The Huawei Mate SE retails for US$229.99. $30 more for an extra gigabyte of RAM and 32 GB more of storage sounds like a pretty good deal. Like, the 7X, however, it runs on Android Nougat out of the box, and we have issues with that.